Trinity Church, the first Anglican Church in Wangaratta, was built on the site of the present cathedral, on the corner of Docker and Ovens Streets, in 1856. The site has subsequently been developed into a precinct, or Cathedral Close, containing a large number of affiliated Anglican buildings. It is the only such example in Australia. Both a church and rectory (the present Deanery) were built in 1856 and the latter remains as the oldest building in the complex. 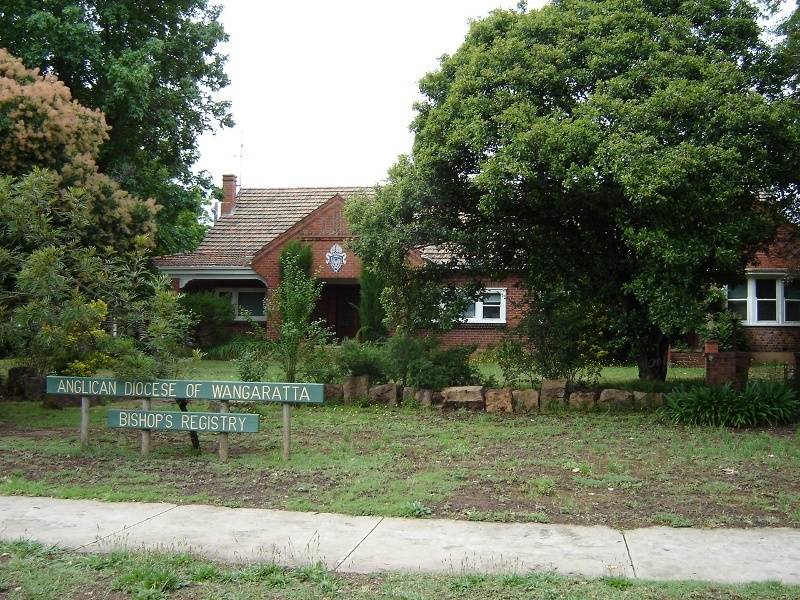 The Diocese of Wangaratta was formed in 1901 and the Bishop's Lodge was subsequently built to the south of the site in 1904. The Cathedral was begun in 1908 with the construction of the western half of the nave, and the second section was added in 1922-4 and the third in 1961-5. The Close itself was conceived c1939 and a curving road to the west and south of the Cathedral was formed. A number of houses, for the use of staff and close associates, were built along its length between 1939 and 1950, and gates were erected at each end in 1963 and 1975. A temporary timber bell tower was added to the site in 1983, containing bells cast in 1806, and War Memorial gardens, situated in front of the Cathedral and created in 1904, complete the precinct. These contain monuments commemorating the Boer War, WW1, WW2 and the Vietnam War. The Holy Trinity Cathedral itself was designed by Walter Butler, the Melbourne Diocesan architect, and the first two stages were completed to his designs. The Lady Chapel, chancel, sanctuary, sacristy and vestries were added to the existing section of nave in 1922-24. The third stage, the completion of the nave and addition of the baptistery, was designed by prolific church architect, Louis Williams. 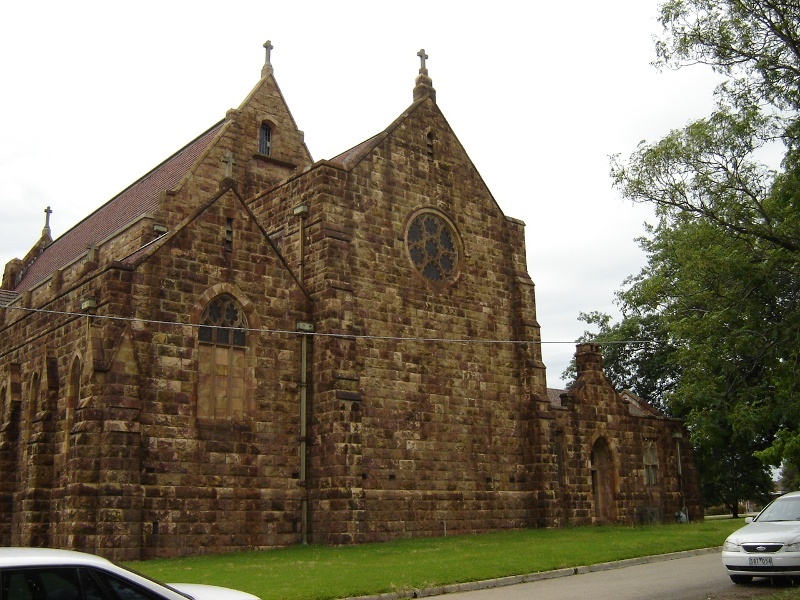 The Cathedral is an Arts and Crafts Gothic style church, built of rough-cut local pink granite, with terracotta tiled roof and an interior of local red brick with geometric patterning in dark brown. 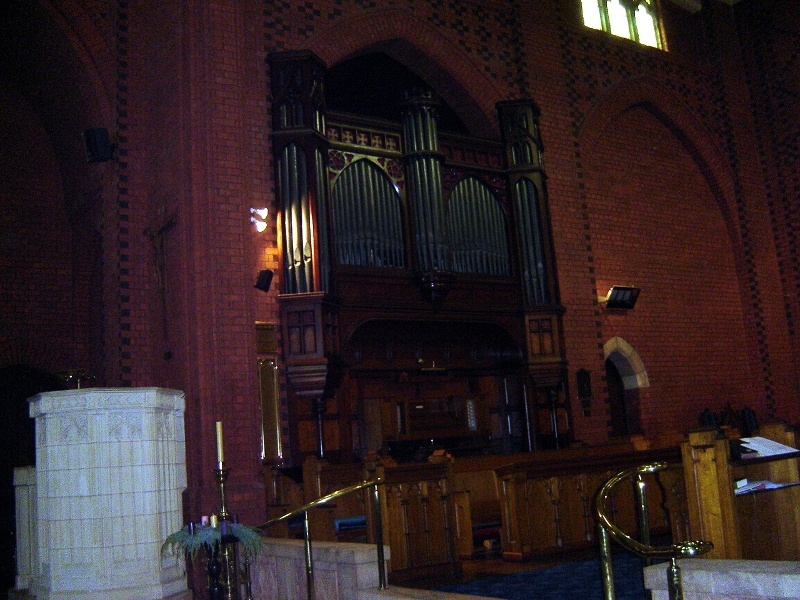 It contains a white marble pulpit also designed by Walter Butler, a number of fine windows and two organs. 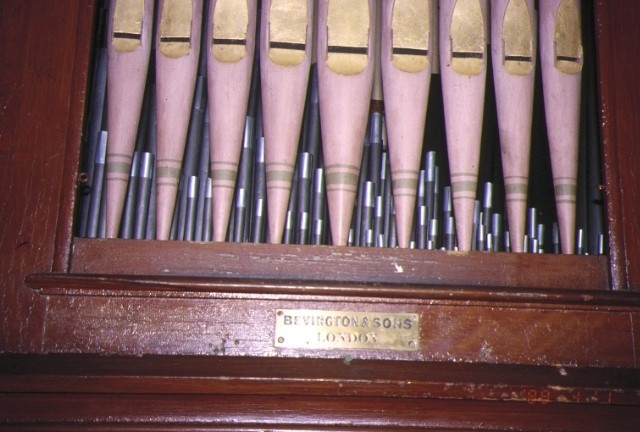 One of these was built c.1845-46 by Bevington & Sons.and is of considerable age, being thought to be the oldest surviving Bevington & Sons organ in Australia and is almost certainly the oldest church organ to survive in Victoria in an intact state. 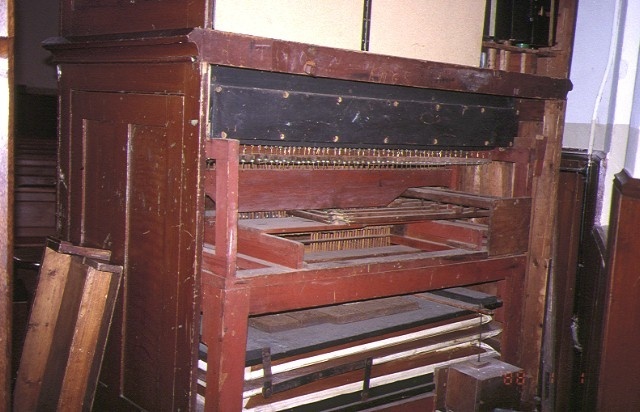 This small pipe organ, installed in the Hamilton Baptist Church since around 1908, was moved to the Wangaratta Cathedral in 2001. 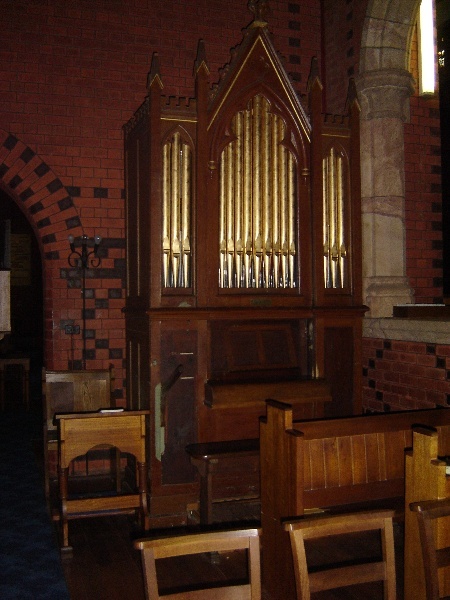 The organ has an attractive Gothic case and console fittings characteristic of early nineteenth century organ building. 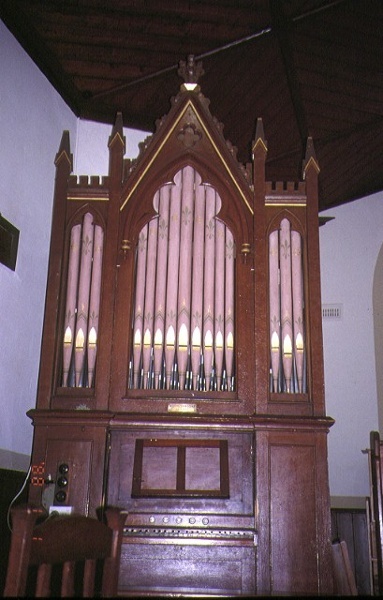 The other organ was built in London by Henry Willis and Sons in 1922 for the Church of Christ Scientitst, Rathmines, Dublin, and was installed in Holy Trinity in 1993. A number of church related buildings are contained in the precinct. The earliest of these is the original Deanery, built in 1856 and located on the north side of The Close, adjacent to the Cathedral. The original part of this building was rebuilt in c1920s, largely out of the old material, however the 1872 eastern wing remains largely unaltered. 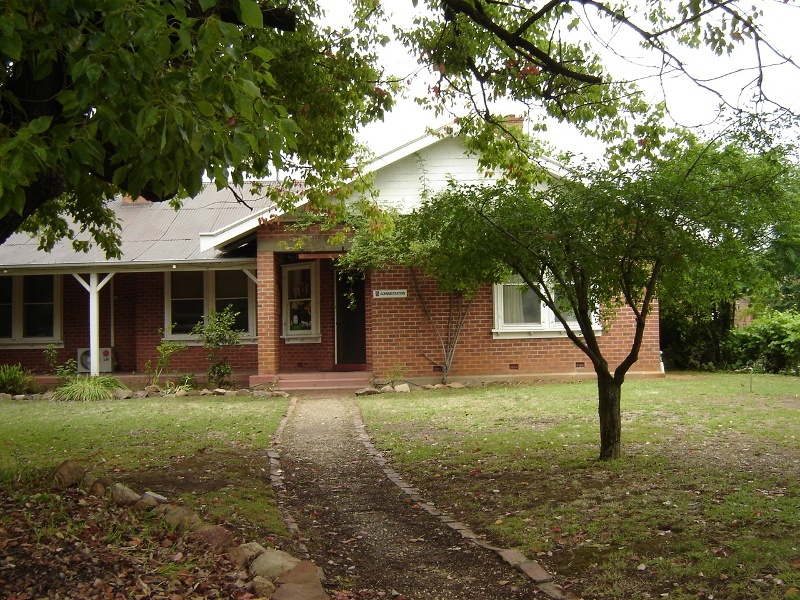 It is a single storey brick house with ashlar patterned stucco and is said to be the oldest occupied house in Wangaratta. Accessed by a footpath from the south side of The Close is the Bishop's Lodge, built in 1904 in a Federation style. 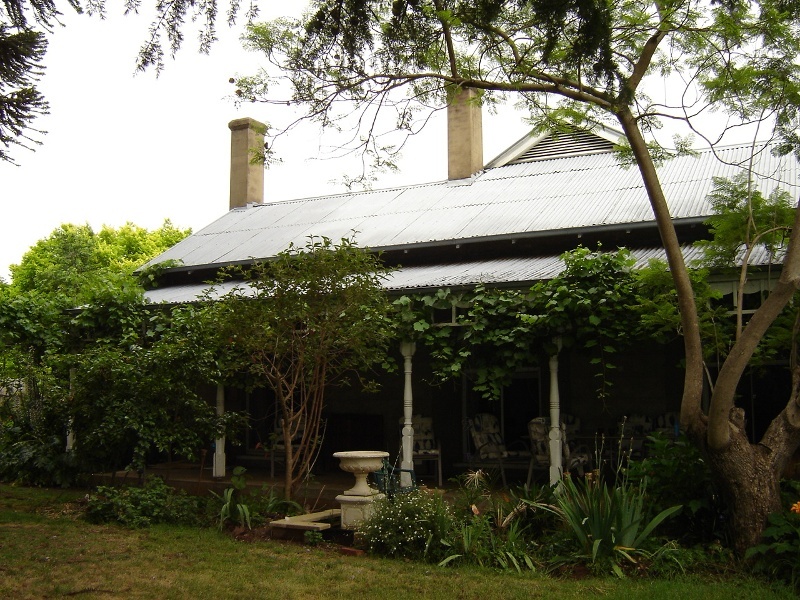 It is a large two storey brick house with contrasting rendered quoined architraves and string courses, corrugated iron roof, half timbered and roughcast projecting gables, tall chimneys, a small hexagonal roof spire and a two storey cast iron verandah. This Bishop's residence is set in fine gardens, with a selection of mature trees and shrubs. Armstrong House, the former Archdeacon's House, was built in 1933 in Ovens Street, and became 1 The Close when The Close was formed some years later. Designed by AC Macknight, this large, single storey red brick bungalow with a gable roof and shingle ends, was built between the Cathedral and the Bishop's House. No.13 was designed as a new Deanery at the Docker Street end of The Close. Built in 1939, it is now used as the Bishop's Registry or the Diocesan Offices, and the old Deanery has reverted to its original use. This large single storey red brick house has an attached office wing and separate entrance and contains prominent gables and decorative tapestry brickwork. No. 11 was probably built in c1939, but possibly in 1946, and occupied by a churchwarden. It is a single storey red brick with tiled gable roof and tapestry brickwork. No. 9 was built in 1946 for a local solicitor who was closely associated with Diocesan management. 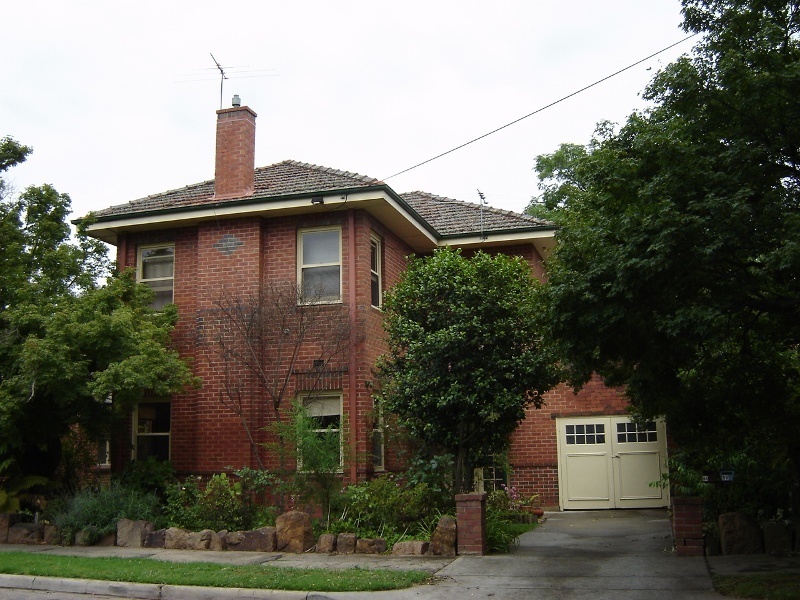 It is a two storey red brick with terracotta tiled hip roof and feature clinker brickwork. No.5, Holy Trinity House, was built in c.1946 as a hostel to provide accommodation for country boys studying at local schools and it continued to be used for this purpose until 1986. It is a two storey red brick building with hipped terracotta tiled roof. No. 3 was probably built c1948 as an annexe for the adjacent hostel and is now the choirmaster's house. 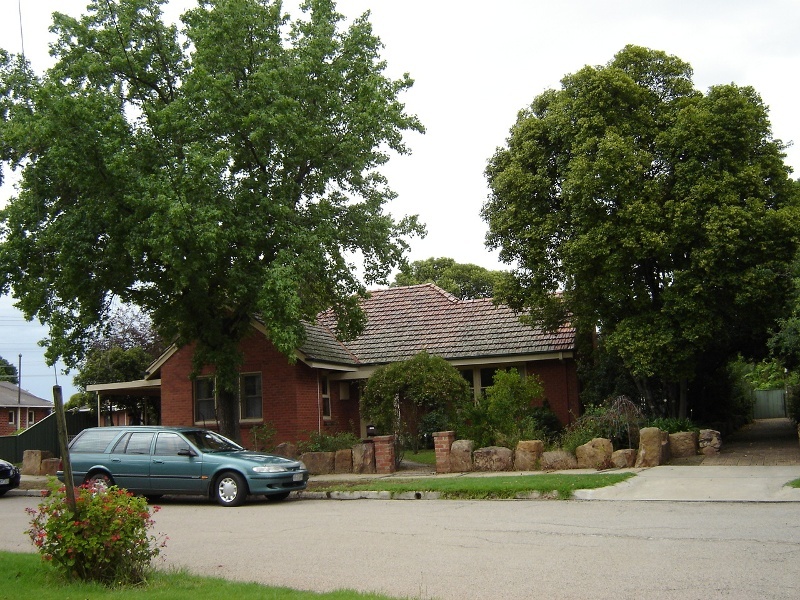 It is a single storey red brick house with hipped, terracotta tiled roof. No. 7 was the last house to be built in The Close in 1950, also as an annexe to the adjacent hostel. 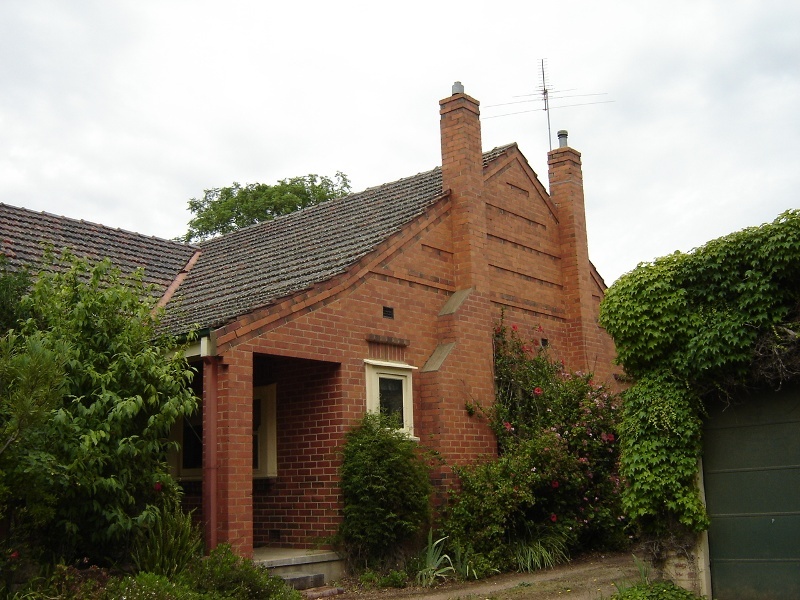 It is a single storey red brick house with gable roof and a wide chimney feature with cream brick vertical contrasts. Two sets of decorative wrought steel double gates, set between brick piers, and associated side gates, enclose this Cathedral Close. 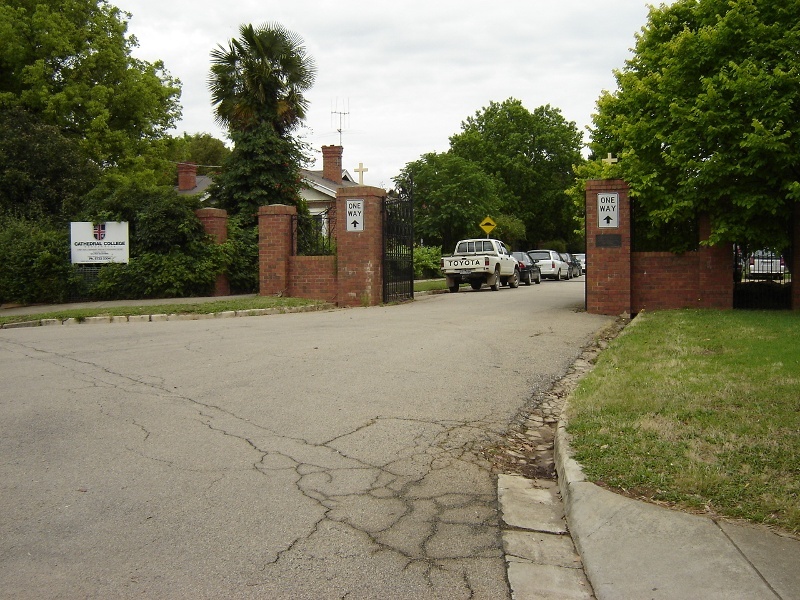 The Inchbold Gates (in memory of a former Mayor of Wangaratta) on Docker Street were erected in 1963 and the erection of the Dicker Gates (a thank offering by Archdeacon Dicker and family) on Ovens Street marked the completion of the Close in 1975. Low garden fences, generally formed from blocks of local granite of various sizes said to have been retrieved from the demolition of the original church building, define the front boundaries of the properties and their gardens contain some fine specimen trees. The Cathedral and Memorial Gardens and the Bishops Court Garden retain elements of their early layout and planting. The Close road and path layout remain and several trees date from about 1900. The picket fence has been removed from Bishop's Palace but the original gates survive. A picket fence once surrounded the Cathedral along Docker Street but was replaced in the 1950s by a rendered concrete fence. Brick pillars and gates occur at either end of The Close. The landscape has been simplified and a number of large trees, including Hoop Pine, Himalayan Cedar, Pines, Oaks and Elms have been removed. A major change has occurred around the memorials, the cannons, the rock edge beds, shrubs and palms have all been removed. The planting once (until the 1950s) featured a Queen Palm (Arecastrum romanzoffianum), Chinese Windmill Palm (Trachycarpus fortunei), New Zealand Cabbage Tree (Coryline australis) and a row of Petticoat Palms (Washingtonia filifera) along Ovens Street. A rare and outstanding Black Plum (Diospyros australis) grows north west (towards Docker Street) of the War Memorial. An English Elm (Ulmus procera) (partially lopped) planted about 1900 remains beside the Bell Tower and was once part of a row of elms along the entrance drive to the first Church from Docker Street. Nearby is a large and outstanding English Oak (Quercus robur). Other trees of landscape and historic value include an Illawarra Flame Tree (Brachychiton acerifolius), Himalayan Cedar (Cedrus deodara), Bunya Bunya Pine (Araucaria bidwillii), and a large Olive (Olea europaea subsp. europaea) next to The Close entrance along Ovens Street. At the rear of the Administration building is a large Kurrajong (Brachychiton populneus), and in the back gardens of 5 and 7 The Close are two large English Elms. The shrub planting includes a wide variety of popular species, including Acer, Euonymus, Spiraea, Camellia, Hydrangea, Nandina and roses. An uncommon and large Cotinus coggygria grows in the Registry garden, there a 3 fine Acer palmatum trees, two Magnolia soulangeana framing the entrance to 5 The Close (former Hostel), an unusual form of Solanum rantonetii with deep purple flower (9A TheClose) and the uncommon creeper Macfadyena unquis-cati (41 Ovens Street). The Bishop's Palace garden retains its original iron entrance gates on Ovens Street, sweeping driveway and lawn with a fine Canary Island Date Palm (Phoenix canariensis) planted in the centre. The north garden features a large Wisteria arbour, and extensive tree and shrub planting along Ovens and Cusack Streets. A vegetable garden and fruit trees are planted in the back garden. The Holy Trinity Anglican Cathedral Close, Wangaratta is architecturally significant to the State of Victoria. 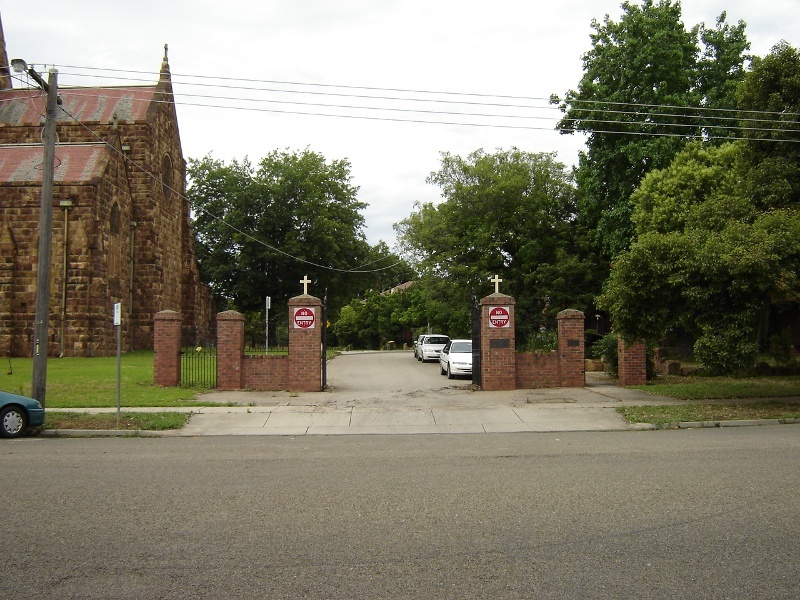 The Holy Trinity Anglican Cathedral Close, Wangaratta Close is architecturally significant as the only known example of a cathedral close in Victoria, and possibly Australia. The Holy Trinity Anglican Cathedral Close, Wangaratta is architecturally significant for its cathedral, the work of prominent architects Walter Butler and Louis Williams. The Holy Trinity Anglican Cathedral Close, Wangaratta is architecturally significant for the composition of the close and the relationship between the cathedral and the the other components of the close such as Bishop's Lodge, the boys' hostel , the rectory, deanery, choirmaster's house, and other residences, as well as the plantings and the War Memorial Garden. The Holy Trinity Anglican Cathedral Close, Wangaratta is historically significant for its association with the history of the Anglican Church in Victoria, and the buildings demonstrate the operation of the church in Wangaratta. The boys' hostel. 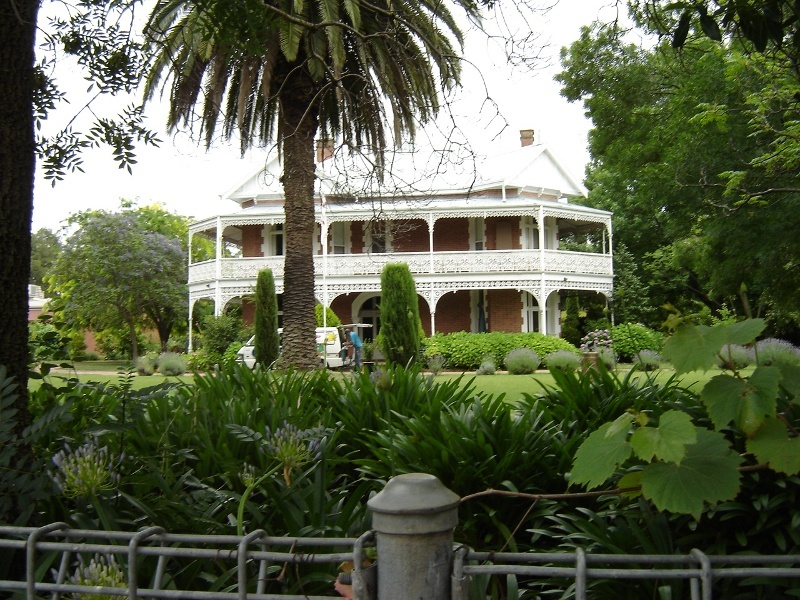 Holy Trinity House, is historically significant for its capacity to demonstrate the difficulties of access to secondary education in rural areas.The site is historically significant for its War Memorial gardenswith monuments relating to the Boer War, World War I, World War II and the Vietnam War. The Cathedral Gardens, incorporating the Memorial Gardens, and Bishop's Palace gardens, are of historical and landscape (aesthetic) significance. The planting includes well established trees in a park like setting, framing views of the Cathedral and Bishop's Palace and contributes to the setting and beauty of the place. The garden beds and plantings along The Close provide an attractive setting for the collection of buildings. Holy Trinity Anglican Cathedral Close, Docker Street, Ovens Street & Cusack Street, Wangaratta, Wangaratta Rural City Council. All of the buildings, features and land marked as follows on Diagram 1065 held by the Executive Director. General: All of the landscape features, plantings, war memorials, road, paths and entrance gates to the Close. 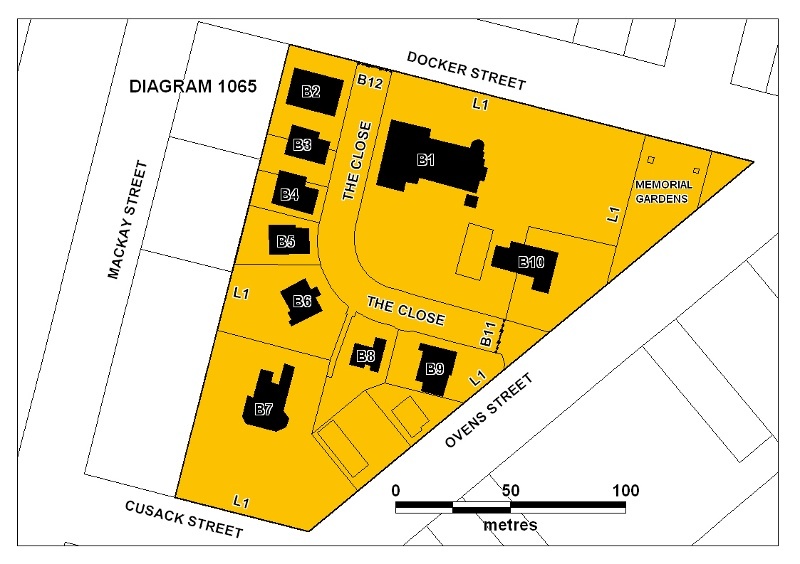 L1 Land bounded by Docker, Ovens, Cusack Streets and to the west by cadastral boundary. B1 Cathedral, Docker Street including Willis Organ and Bevington Organ. B2 Diocesan or Bishop's Registry, 13 Cathedral Close. B3 House, 11 Cathedral Close. B4 House, 9 Cathedral Close. B5 House, 7 Cathedral Close. B6 Holy Trinity House, 5 Cathedral Close. B7 Bishops Lodge and Garden, 33 Ovens Street. B8 Choirmaster's House, 3 Cathedral Close. B9 Armstrong House, 41 Ovens Street or 1 Cathedral Close. B10 Deanery, 2 Cathedral Close. B11 Dicker Gates, Ovens Street. B12 Inchbold Gates, Docker Street. The first Anglican church in Wangaratta, Trinity Church, was built on this site in 1856. The Honorary Architect was J Dobbyn. The Rectory (the present Deanery on Ovens Street) was built at the same time. 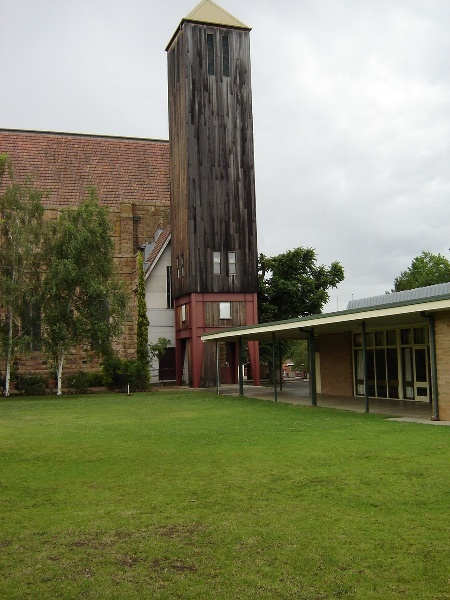 This site has been a centre of Anglican worship in north-east Victoria since then. In 1872 the church was enlarged and a wing added to the Rectory. When the Diocese of Wangaratta was created in 1901 the Holy Trinity Church at Wangaratta was still sound, and was used as a pro-cathedral. 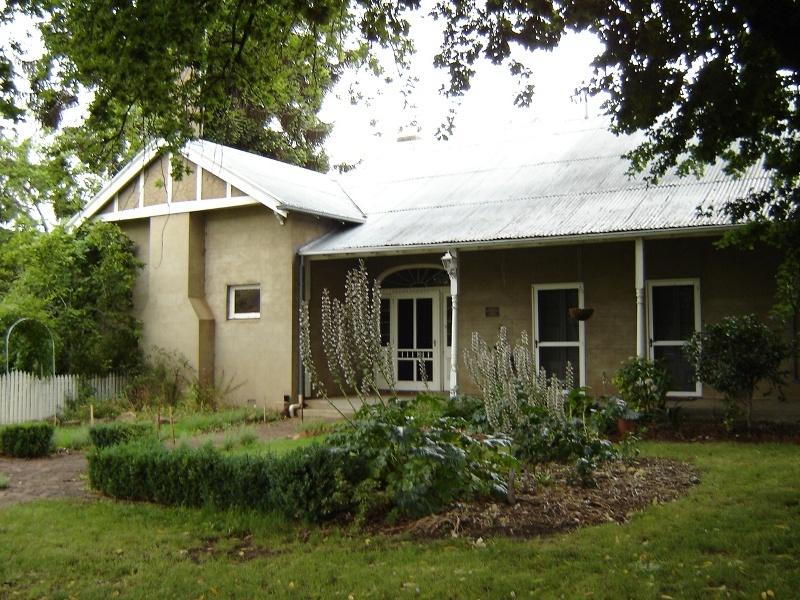 A Bishop's Lodge was built to the south of this in 1904 as the residence of the first Bishop of Wangaratta, Thomas Armstrong. When it was felt that a more appropriate church was needed, it was originally intended simply to extend the existing church. However Armstrong decided to build a new brick cathedral, as a symbol of diocesan identity and as a centre for worship of an exemplary kind [Church in a Landscape, p 74]. So much money was raised by the parish, in particular a donation by Mrs Mary Jack, that it was decided to build in stone, with an interior of brick patterned in black, and on a larger scale than had first been planned. A design competition was held, and won by Butler & Bradshaw, with Walter Butler completing most of the drawings. Butler was the Melbourne Diocesan architect, and one of Melbourne?s leading exponents of the Arts and Crafts school. The first section was begun in 1908, and dedicated in 1909. It was built by W McKnockiter for about £5,000, and consisted of half the nave, with two wooden ends, a wooden chancel and an iron roof, the ends, chancel and roof being temporary. The walls alone, of Warby granite quarried at South Wangaratta and chiselled on site, and perhaps the floor, were intended to be permanent. The building of the second stage, the chancel, sanctuary, Lady Chapel, sacristy and vestries, was made possible by the bequests of two wealthy businessmen, Francis Heach and Thomas Bell, who between them left about £17,750 for the Cathedral. The architect for the second stage, built in 1923-4 and costing £18,000, was also Butler, and work was superintended on site by McKnockiter. The construction work went on around the temporary wooden chancel, and was practically complete before this was removed. Amstrong however never built probably the most interesting and original part of Butler's design: the two tapering towers at the west end. More appropriate furnishings and fittings replaced much that had been temporary, the major items being the Bishop Armstrong Memorial pulpit of white marble, and the organ screen, choir stall and pews. 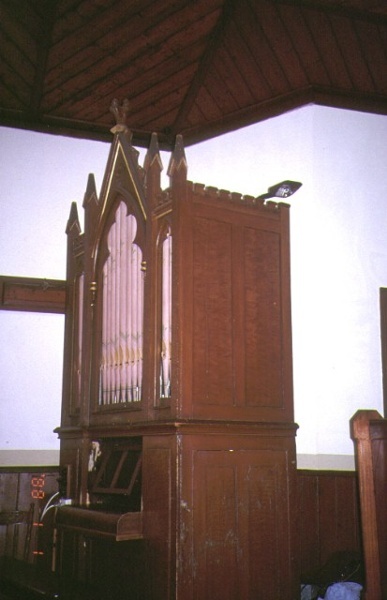 The pulpit was designed by Butler, and installed in 1934 as a memorial to Armstrong following his death. Auguste Fisher, one of Melbourne's finest Arts and Crafts artists, was commissioned for windows in the cathedral. The cathedral was described in the Church Standard as the most impressive church outside Melbourne, and it was acknowledged by a cable from the Archbishop of Canterbury. There were even local commercial advantages, as property prices in Wangaratta rose ten percent after the diocese was proclaimed, a rise attributed partly at least to the town's status as a diocesan centre [Church in a Landscape, p 72]. The Depression, WWII and its after effects, particularly the acute shortage of building materials, delayed the completion of the Cathedral. 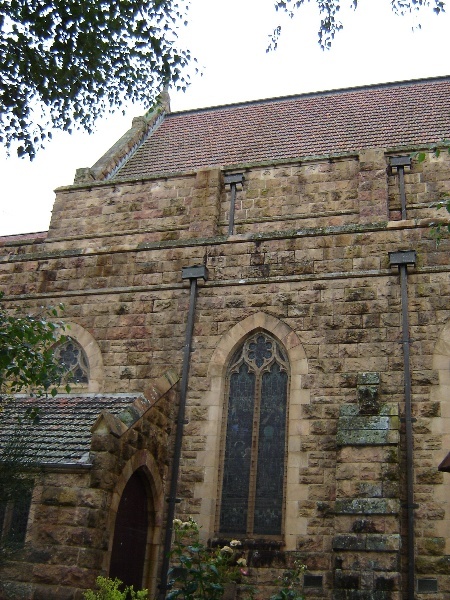 Butler had died by the time the third stage was built in 1961-5, so Louis Williams, the prominent architect of a number of Church of England churches in Victoria and NSW, was engaged. He substantially altered Butler's original design for the entrance end, which had never received approval from the church. The final design of the church was therefore dependent on Butler for the style, the choice of materials and the design of the west end, but on Williams for the appearance of the east (entrance) end. The contract price for this stage, built by L H Brown Williams and Joseph Smith was £90,697, but the final cost, including furnishings and landscaping, was to be £180,000, and took two and a half years longer to complete than originally estimated. The first step was the demolition of half of the nave of the old church, which had for fifty years stood at the east end of the new nave and been used as the parish hall, then the nave and aisles were extended by three bays and a baptistery and entrance added. Louis Williams designed much church furniture, and probably designed many of the interior fittings of the church, such as the font and baptistery screen. The height of the church to the roof ridge is 75 ft, the nave is 100 ft long by 50 ft wide, and the total length 160 ft. The west windows were created by the Melbourne glass firm of Brooks Robinson for its completion in 1965. They were designed by Jo Stansfield, the firm?s supervising artist. In the top panels is a priest offering the eucharist, and below are a series of landscapes, commencing with pioneer settlement, but going on to show a twentieth century town and housing, a modern factory and farm equipment. The location of an intended stone bell tower can be seen to the south of the entrance, apparent from the incomplete stone courses and a temporary wall. The site is now occupied by a temporary timber tower, which was begun in 1983. Its bells were cast in 1806, making them the oldest peal of bells in Australia. These were purchased in 1976 from a redundant British church with funds from a bequest from Francis Heach. Bishop Armstrong's son, Brian, funded the building of the tower, designed by the Melbourne architect George Mitchell. A number of residential and administrative buildings are scattered around the precinct. The oldest is the Deanery. In about 1920 the original 1850s part of the Rectory was rebuilt, largely out of the old material, but the eastern wing added in 1872 remains practically unchanged [The Cathedral Church of the Holy Trinity Wangaratta, np]. After the new Deanery was built on Docker Street it became a Parish Centre. The Bishop?s Lodge was built in 1904 on the corner of Ovens and Cusack Streets. Armstrong House was designed by the architect A C Macknight and built for the Archdeacon in 1933 on Ovens Street between the Cathedral and the Bishop?s House. It became number 1 The Close when The Close was built, and is now the Assistant Curate's House. The Close was the brain child of Archdeacon Percy Dicker and was planned by the Parish in 1939, in a period of expansion and new building around the Cathedral that started then and recommenced after WWII. It is a complex of buildings on the site approached by its own private road; it is distinctive both in appearance and use, and is unique in Australia [Church in a Landscape, p 161]. It runs around the rear of the Cathedral across land owned by the church, from the New Deanery on Docker Street to the Archdeacon's House on Ovens Street. 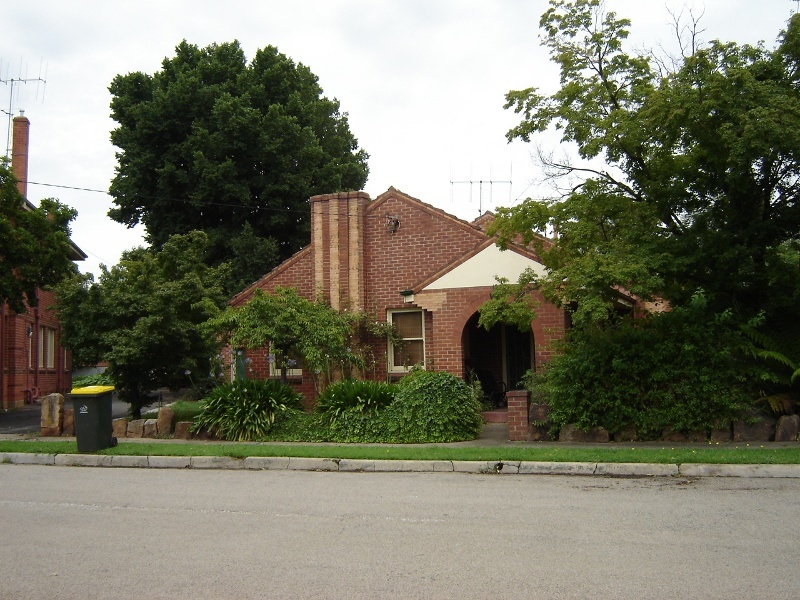 A number of houses closely associated with the church were built along The Close between 1939 and 1950, all designed and built by J Law & Son, well-known Wangaratta builders. The total cost was £22,000. The development of The Close, with its pleasing greens, shrubs and trees, opened up previously unseen views of the rear of the Cathedral.
. No 13, on the corner of the Close and Docker Street, intended as a new Deanery and built in 1939, when The Close first proposed. The old Deanery has now reverted to its original use, and this is now the Diocesan or Bishop?s Registry.
. No11 The Close, most likely built in c1939, but possibly in 1946, after WWII. It was occupied by a Churchwarden, V Edgar, and his family.
. No 9 was built in 1946 for Mr & Mrs F C Purbrick. Mr Purbrick was a well-known local solicitor, closely associated with the management of the Diocese, who moved here after his retirement, and was given a life occupancy. A memorial to him in the Cathedral notes that he was Vestryman and Church Warden 1902-1945, Advocate of the Diocese 1903-1945 and Registrar 1907-1945.
. No 5, Holy Trinity House, was commenced in 1946. 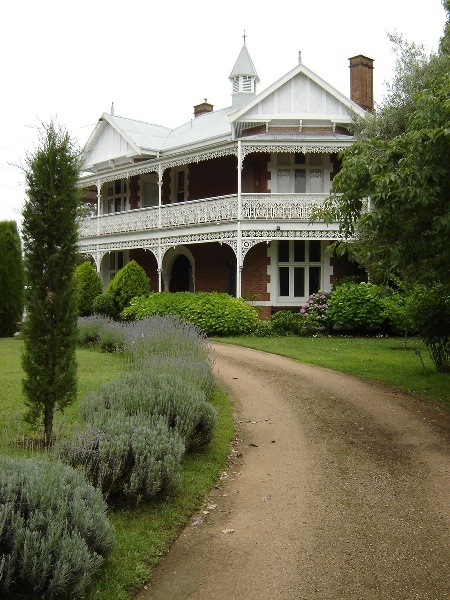 It was a hostel for country boys coming to Wangaratta to study at the High School or Technical School. Before it was built twenty-one boys had boarded at the rectory. With transport made easier by school buses and private cars, the need for accommodation later diminished, and in 1986 the building became the Trinity Community Drop In Centre.
. No 3 was probably built c1948 as an annexe for the boys' hostel next door, perhaps as the Warden's house. It is now the Choirmaster's house.
. No 7, the last house to be built in The Close, was built in 1950, also as an annexe to the boys' hostel next door. It is now a private house. 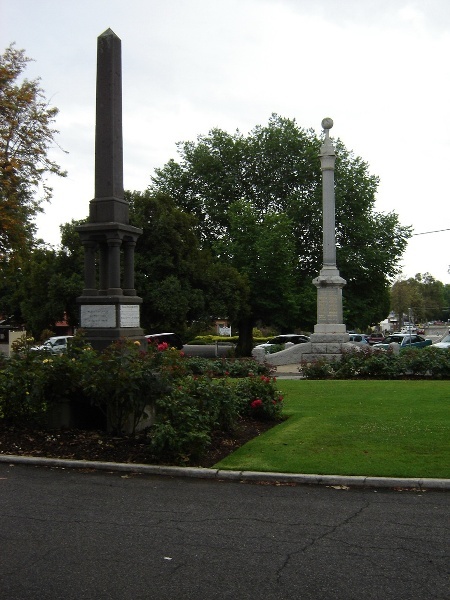 The War Memorial Garden, a triangular area on the corner of Docker and Ovens Street, in front of the Cathedral, was created in 1904 to the east of the old church as a setting for the Boer War monument, made by Hoskins & Co of Hawthorn, which was unveiled in 1903. In 1923 a larger monument, designed by Arthur Rundle and James McLeod, was set up to commemorate the local soldiers killed in WWI. Since then further panels have been added to this in memory of local soldiers who died in WWII and the Vietnam War. Specific Boer War memorials are quite unusual, and the presence of two separate war memorials placed side by side is even more so. Walter Butler is regarded as one of Victoria's foremost architects. He was born in Somerset in 1864, and at fifteen he was articled to Alexander Lauder of Barnstaple. In 1885 he was encouraged by W R Lethaby to move to London and work with J D Sedding. He was accepted into the Arts and Crafts and domestic revival circles centred on William Morris and Richard Norman Shaw, and these early influences always dominated his work. In 1888 Butler left for Australia, perhaps at the prompting of the young Melbourne architect Beverley Ussher then visiting London. From 1889 to 1893 Butler was in partnership with Ussher. In 1896 he was joined by George Inskip but they parted in 1905, and he formed a partnership with Ernest Bradshaw which lasted from 1907 to 1916. After WWI he was in practice with his nephew Richard as W & R Butler, but from the 1920s, after the loss of his son in WWI, he started to relinquish his clients to his younger partners. In the late 1930s he was in partnership with Hugh Pettit, but he retired when Pettit enlisted for WWII. He was a superb draughtsman, and is reputed to have controlled all the designing and detailing in his office. Many of Butler's clients were wealthy businessmen and pastoralists for whom he designed grand houses in Melbourne and the country. He designed banks for the Union Bank of Australia, as well as several city office buildings. As architect to the Diocese of Melbourne from 1895 he designed the extensions to Bishopscourt (1902) in East Melbourne. As well as Wangaratta Cathedral his other church works includes St Albans Armadale (1899), and the colourful porch and tower to Christ Church Benalla (c1910). 'Born in Hobart in 1890, Louis Williams initially served articles with Frank Heyward of Richards & Heyward in Hobart. A particular interest in ecclesiastical work led him to complete his articles with Alexander North in Launceston. When North subsequently opened a practice in Melbourne in 1912-1913, Williams was appointed the junior partner. North himself retired at the end of World War One, while Williams continued to practise until March 1976, during which time he designed more than 130 churches, mainly Anglican, but also Presbyterian, Methodist and a Christian Science Church in Elsternwick. From 1961 to 1964 the practice became successively Louis Williams & Partners and then Louis Williams, Paul & Johnson. 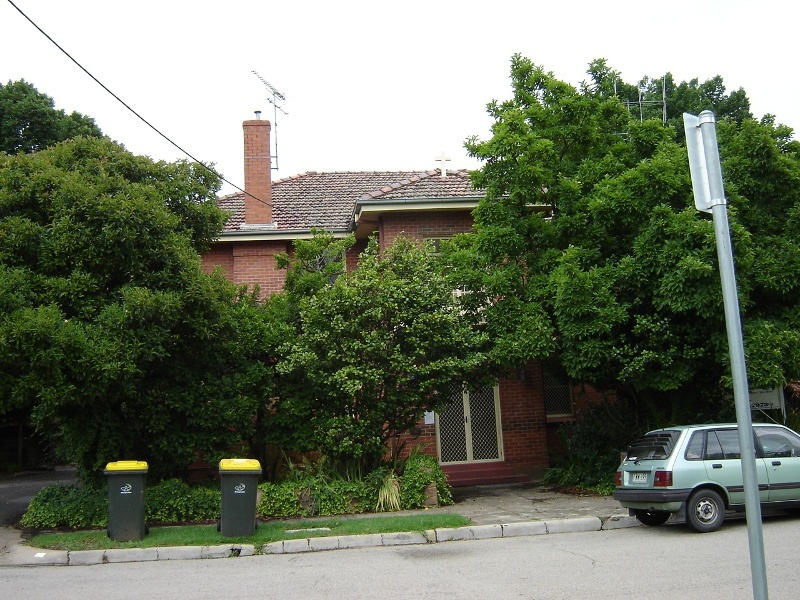 William's practice remained in Melbourne and he relocated his office from the city to his Brighton home in c1941. However he undertook much interstate work from c1920, including that completed as Diocesan architect for Bathurst and Grafton, and examples of his work can be found in each Commonwealth State. * Installation, removal or replacement of kitchen benches, cupboards and fixtures including sinks, stoves, ovens refrigerators, dishwashers etc and associated plumbing and wiring. * New or replacement planting which conserves the historic landscape character including specimen trees, avenues, rows, shrubberies flower beds, and lawns. Construction of a new Parish Office as shown on drawings by Tracey Toohey Design & Drafting dated January 2006 and marked 06529-01 to 06529-04. 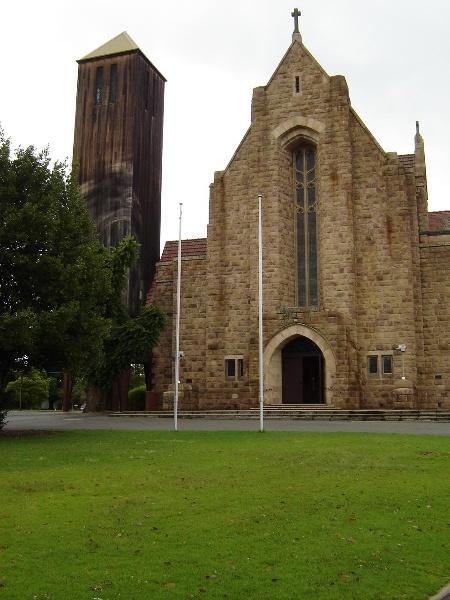 The cultural heritage significance of the Holy Trinity Anglican Cathedral Close is principally due to its planning as a cathedral close of the mid-twentieth century, its rarity and the intact nature of the site. Important elements include the cathedral and the other listed buildings, the exotic plantings, the war memorials, and the memorial entrance gates.The significance of the Cathedral lies in its architecture, its fine interior and its pipe organs. The purpose of the permit exemptions is to allow works that do not impact on the significance of the place to occur without the need for a permit. Alterations that impact on the significance of the exterior and interior of the Cathedral and the Bishop's Lodge are subject to permit applications, but changes may be made to the interiors of the other buildings without the need for a permit. Any new buildings on registered land or changes to the layout of the Close would require a permit. Works including demolition and internal modification (but not additions) to the adjacent buildings not listed in the extent of registration do not require a permit.